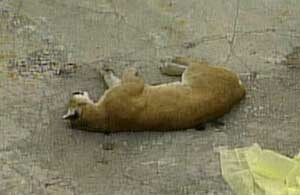 So you probably heard about the cougar that was shot dead by police in the Roscoe Village neighborhood in Chicago. The big topic of debate has been whether it was necessary to kill the cougar. I don’t think that’s issue at hand. I’m offended by the quotes provided by the police at the scene. They have gone on record as saying that the cougar was attacking them and that’s the reason why they had to shoot it. I don’t buy it. It’s been reported that 18 shots were fired. 18. Lemme get this straight. There’s a cougar attacking you. You need 18 shots to kill it? Gimme a break. Let’s say I buy their story. For a cougar to be attacking something or someone, the cougar would need to be within a somewhat close range of the subject it is apparently attacking. So why did it take 18 shots to take down the cougar? Either the Chicago police who killed the cougar are incredible terrible gunsmen with absolutely no aim or they are liars. JA3 cleared up this issue for me. I am sorry, Chicago Police. From what I heard, you could count on your two hands the number of recorded mt. lion attacks on humans. I believe it is VERY rare. I also believe there are FAR MORE recorded attacks of humans on mt. lions. I hope you don’t have small dogs because coyotes have been known to kill/eat small dogs that they come across.